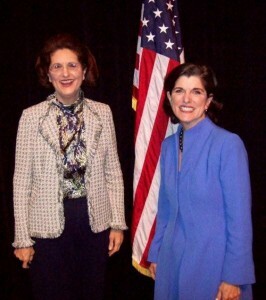 The President’s two daughters, Luci Baines Johnson and Lynda Johnson Robb, came to Texas State University-San Marcos to serve as guest speakers for the final event of the LBJ Centennial, commemorating Lyndon Johnson’s 100th Birthday. The daughters brought their unique vantage point to share stories and discuss how the events of the 1960s impacted their lives. Harry Middleton, a former Johnson speechwriter and Director of the LBJ Library and Museum, served as moderator. Robert Hardesty, another former Johnson speechwriter and past President of Texas State, was also present. Past recipients of the LBJ Outstanding Senior Award were recognized in a ceremony presented by Bill Wright, the award’s first recipient. 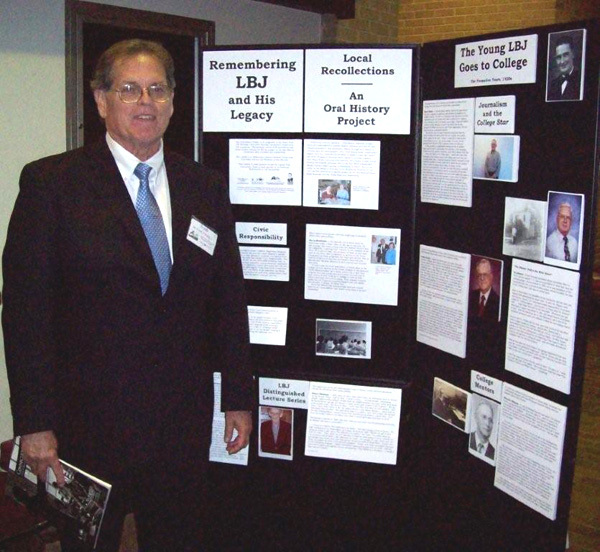 The LBJ Museum of San Marcos participated with a traveling exhibit of oral histories and photographs in the foyer of Evans Auditorium.